AVALON Hollywood is thrilled to be hosting Cazzette with Niko the Kid on Saturday, March 2nd, sure to be serving some heat on the decks. Known for his unique approach to house, Cazzette delivers refined curating skills making him a master ready to take on the dance floor. LA-based producer Cazzette’s eclectic style of house music takes hypnotic melodies and deep soundscapes, creating a refined sound. Cazzette’s stand out tracks “Missing You” position him as a quickly rising act among the electronic music scene. Honing in on a distinctive sound and garnering millions of plays across streaming platforms, Cazzette has concretized his spot in electronic music and is certain to deliver an unforgettable set. Funk and disco infused phenomena Niko the Kid can be recognized for dance anthems like “Sky Walker” with Travis Scott and Miguel, or the bass boosting “Piñata”. With his craft focused on massive piano melodies and dominating diva vocals, the producer brings a sound reminiscent of late 90s house tunes. 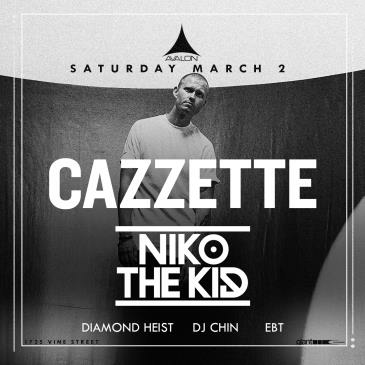 Pioneering itself as a source for contemporary music culture, AVALON is stoked to be bringing Cazzette for an exclusive evening to Los Angeles. Don’t miss the two brilliant house acts as they go in deep for an unforgettable occasion. Grab your tickets below.